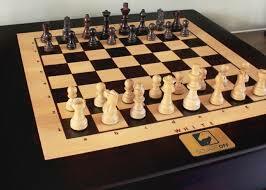 Square-Off Chess Board (self moving)! Ever wanted to play chess but did not have any friends to play? No problem ... we will help you! Kickstarter, an American public-benefit corporation will be bringing to you the smartest chess board ever! yes ! I am not joking, the pieces on this chess board actually move on their own. You all might have seen wizard chess in harry potter but never been able to experience it, but you can now! In today's world everyone is busy in their own life, if you want to play a game of chess you may ask your family members but they are busy in their daily routine, you ask your friend he might also be busy, and you end up playing chess online which is so boring. So what to do ?! We cannot even play a game of chess physically? Well not to worry. Kickstarter's aim is to bring out creative projects and once again it has succeeded! This intelligent chess board lets you play with any player around the world PHYSICALLY. You can also challenge the board's artificial intelligence. How cool right ?! 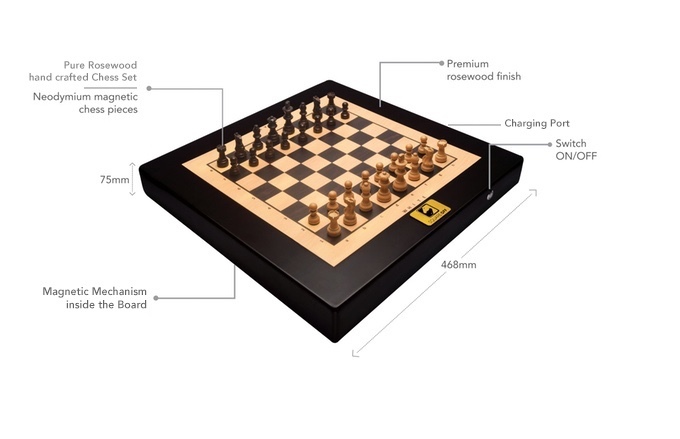 The chess board has been beautifully designed and has a premium rosewood finish. The board is rechargeable and comes with an ON/OFF switch so that you can turn the board off when not playing. The mechanism used in the board is not ordinary. It is the magnetic mechanism which does the trick. The chess pieces are also neodymium magnetic which enables them to move on their own as the mechanism inside the board guides them. SQUARE OFF MODE - This is the mode that lets you challenge any player around the world. You can either play board vs board or board vs app. The pieces will move on their own reflecting moves of your opponent. TRAINER MODE - In this mode, you can challenge the board's artificial intelligence and board actually has 20 different difficulty levels to challenge you! LIVE STREAMING MODE - This is the most amazing feature of this magical chessboard. It allows you to tune into any match, worldwide! You can also record your all your matches and watch them whenever you want!